Whether you’re looking for repairs for your heat pump or furnace or if you need a brand new air conditioning system installed, call Quality Air Heating and Air Conditioning. We offer a full range of heating and air conditioning services in Harrisburg, OH including installation, repair, maintenance and replacement. We can work on a huge range of systems and our highly-trained technicians are dedicated to your total satisfaction. Things often happen unexpectedly and you need an HVAC contractor that can be there at any time. Quality Air Heating and Air Conditioning offers 24/7 heating and air conditioning repair in Harrisburg, OH in case your heater or AC break down after hours. Call us today! Keeping your home warm during the winters is a lot of work for your heating system. If you need heating service in Harrisburg, OH call Quality Air Heating and Air Conditioning. We can work on a large range of systems including furnaces, heat pumps, geothermal systems, ductless mini split heating and more. For repairs, we’re available 24/7 and we can also help you install a new system in your home quickly. Call today to find out more. Your heating system works hard throughout the winter to provide you with comfortable heat. All this extended use can cause your heater to develop a large variety of problems. Call Quality Air Heating and Air Conditioning for all your heating repair in Harrisburg, OH. We can work on many kinds of heating systems including furnaces, heat pumps, ductless mini split heaters, geothermal systems and more. We understand how important it is to have access to heating at all times which is why we offer 24/7 emergency heating repair in Harrisburg, OH. Are you tired of coming home to a hot and humid house? Does your air conditioning system need replacing? Quality Air Heating and Air Conditioning is here with comprehensive air conditioning service in Harrisburg, OH. Whether it’s installation that you need or repair for your ailing AC, give us a call. Our talented technicians can handle any job because of their years of training and experience. Call us today for quality air conditioning service in Harrisburg, OH. Having a broken air conditioning system likely means that the comfort in your home is suffering. Every homeowner needs to have a nice, cool environment to come home and relax in after a hard day’s work. Call Quality Air Heating and Air Conditioning for air conditioning repair in Harrisburg, OH. If your air conditioning system is icing up, not delivering enough cooling or making a strange noise, we can fix it. We’re available 24/7 for emergency air conditioning repair in Harrisburg, OH because we know that things don’t always happen when it’s most convenient. If you’ve spent even a few minutes browsing the air conditioning market for a new system, you know just how large and complex the market is. But when you call Quality Air Heating and Air Conditioning for air conditioning installation in Harrisburg, OH we’ll help you through the whole process. We can even help you find a new system if you’re having trouble determining which type or size of unit is right for you. Call us today to talk with one of our Harrisburg, OH air conditioning installation experts. Here at Quality Air Heating and Air Conditioning, our air conditioning maintenance program in Harrisburg, OH is one-of-a-kind. When you sign up for our program, you get regular tune-ups from our experts where they will thoroughly inspect, clean, and repair your entire AC system. Doing this could reduce the need for repair, increase the system’s efficiency and also keep it operating for longer. But our members also get additional perks including reduced prices, priority service over non-members and much more. Call us today to find out more. If you’re fed up with your air conditioning system breaking down all the time or if you’re ready to upgrade to a newer, more efficient unit, call Quality Air Heating and Air Conditioning for air conditioning replacement in Harrisburg, OH. We’ve worked with countless customers to help them increase the efficiency and comfort of their home with a new AC. Contact us and one of our air conditioning experts will be able to answer any questions that you have. Business owners cannot check on their heating and air conditioning systems on their own. That’s why you should call Quality Air Heating and Air Conditioning for any commercial HVAC service that you need. If your heater or AC isn’t producing enough heating or cooling, call us for commercial HVAC repair in Harrisburg, OH. If it’s installation that you need, we can help with that as well no matter what type of equipment you need to have installed. We have years of experience working with all types of businesses and we’re available 24/7 for emergency HVAC services as well. Call us anytime and you’ll always get a live person on the other end of the line. Having your HVAC system break down can mean big trouble for your business, so call Quality Air Heating and Air Conditioning when you need any commercial HVAC repair in Harrisburg, OH. Whether your commercial chiller isn’t working right or your cooling tower has stopped working, our experts can get the job done fast. It can be tempting to try to repair your equipment on your own but this will not end well. Let the Harrisburg, OH commercial HVAC repair professionals at Quality Air Heating and Air Conditioning do the job right the first time. 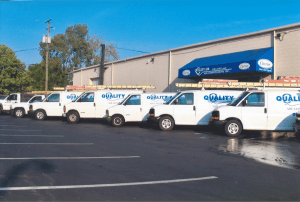 Whether you’ve just moved into a new building and you need a new HVAC system or you’re ready to replace your existing system, call Quality Air Heating and Air Conditioning for all your commercial HVAC installation needs. There are a lot of different types and brands of systems on the market and it can be hard to determine which one is right for you. That’s where we come in. Our techs can help you figure out exactly which type and size of system is right for your particular business. Call us today to talk with one of our Harrisburg, OH commercial HVAC installation experts. Did you know that there are people who never get their car’s oil changed? You can only imagine what type of damage that does to the engine. The same principle applies to your HVAC system as well. If you run your heater or AC all the time but never get it tuned up, it can cause huge problems for you. That’s why Quality Air Heating and Air Conditioning offers total commercial HVAC maintenance in Harrisburg, OH. Our program includes regular visits from our technicians, reduced pricing, extended warranties and much more. Heat pumps work by moving heat from one place to another. In cooling mode, they move heat from inside your home to the outside. In heating mode they do just the opposite: they move heat from the outdoor air into your home. Quality Air Heating and Air Conditioning offers total heat pump service in Harrisburg, OH for all makes and models. If you’re interested in replacing your current HVAC setup with a heat pump, just let us know. Already have a heat pump but it’s malfunctioning? We provide fast and high quality heat pump repair in Harrisburg, OH. Furnaces are terrific heating systems because of their reliability and efficiency. However, like any other piece of equipment they can eventually break down and require repair or replacement. Quality Air Heating and Air Conditioning is here with outstanding furnace service in Harrisburg, OH for all models, including electric, gas, and propane. We can help you install a new furnace if yours has stopped working and we can also repair your existing one if it’s blowing cool air or making any strange noises. Call us today!